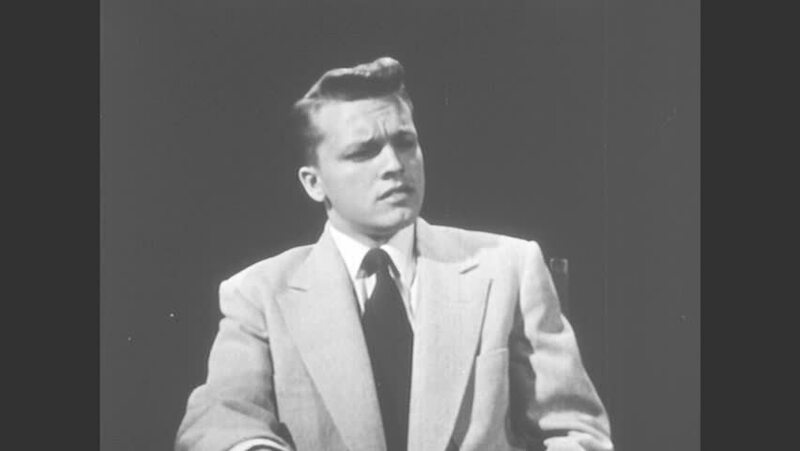 1950s: teen boy in suit and tie stands at podium and speaks to men in seats. teenage boy sits and nervously adjusts necktie. hd00:241950s: Face of man. Man stands straight and wears a suit. Leaves from plants move with wind, sky in the background. hd00:191950s: Boy in suit nods while talking to woman, looks dejected. Boy sits on couch between adult man and woman, points at book. Illustration of office sign entitled "MINISTRY OF PROPAGANA"
sd01:48CIRCA 1930s - James Everett Sanders heads the Grand Old Party in Chicago and a horserace in Homewood is underway, in Illinois, in 1932.
hd00:281950s: Young man in sweater stands at desk talking to man and woman on other side. hd00:311940s: Men in rows of group therapy audience listen to therapist intently. Therapist speaks to group with advice. sd01:13CIRCA 1950 A music teacher teaches his student to breathe correctly while singing. sd02:201950s: With student examples, Professor Morgan demonstrates the importance of using a language that your audience will understand.